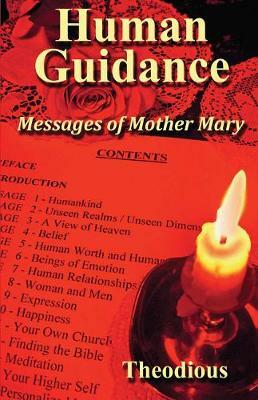 Human Guidance: Messages of Mother Mary is divided into two main sections. The first section contains messages that describes what it means to be human and directs you on a path to find your own personal guidance and answers. It addresses topics such as your Higher Self, realms a... read full description below. Human Guidance: Messages of Mother Mary is divided into two main sections. The first section contains messages that describes what it means to be human and directs you on a path to find your own personal guidance and answers. It addresses topics such as your Higher Self, realms and dimensions, healing yourself and healing others, meditations, relationships, free will, prayer, personalized information, nature and the earth, and more. The second section gives the Laws of Mary presented as a guidepost or guidelines for living a positive and meaningful life. Love, truth, respect, justice, forgiveness, mercy, humbleness, and Mother Earth are just a few of the many Laws discussed in the second section. Mary conveys her messages through modern language which is informative, easy to follow, and to understand. Some of the concepts may seem simplified, but upon second consideration, actually make you realize the true meaning and importance of following these Laws to improve yourself, this world, our home planet, and in living your day-to-day lives. Both parts of this book give you a foundation for positive growth and a recipe of steps to take on how to find your own answers. Theodious is a scholar in his own right and a student of truth. Theodious has been practicing self-hypnosis and meditation methods longer than the age of many of the readers of his books and writings. He does not wish for any publicity, notoriety, interviews, and the like. He just wishes for his findings to be brought forth to the world and may the reader keep an open mind and absorb the information as it was intended. While vacationing at a resort in the eastern United States, we, at Twin Flames Creations, LLC met Theodious. We came to the understanding that he was a kindred spirit of sorts when it comes to searching for the Truth in life. After several conversations, Theodious approached us and asked if our business would be interested in publishing some of his writings. Although his writings could be labeled as metaphysical or esoteric in nature, Theodious considers his work the byproduct of truth-seeking. After hearing his story, Twin Flames decided to help bring his information to the world. If some of these messages that Mother Mary brings forth rattle your belief cage, maybe that is a good thing. Keep an open mind, go within and seek the Truth, and ponder these messages with love as they were given with love for the Children of Earth.